The beautiful, light purple flowers of the lavender plant shouldn't harm your kitty. 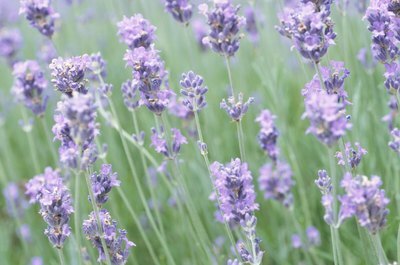 Lavender seems to be everywhere -- in kitchen cabinets, soaps and sachets, herb gardens and even medicine chests. Humans just cannot seem to get enough of this beautiful, aromatic plant. But does lavender pose a threat to our beloved felines? Reliable authorities indicate that lavender, in moderation, is safe. Lavender is beautiful and smells wonderful. Many people love to keep lavender around the house and use products that contain lavender flowers or lavender oil. Cats, too, have a fondness for aromatic plants that are tasty and may be drawn to a fragrant herb such as lavender. The ASPCA and Animal Planet do not include lavender on their lists of plants and herbs that are potentially poisonous to cats, meaning a lavender plant in your garden or home poses no danger. Moderation is the key when it comes to cats consuming lavender. The ASPCA suggests that "nibbles" are fine, but it's best your cat not eat too much lavender, or any herb for that matter. Over-consumption has the potential to cause gastrointestinal problems and other complications. A good rule of thumb is to check with a vet or reliable animal organization before introducing any new plant, herb or food into your cat's diet. Lavender oil, which is found in some cat litter and cat toys, is also generally safe when added to products designed for your cat. It is important to always check with a vet, however, if you are thinking of using concentrated lavender oil for aromatherapy or some other purpose. The ingestion of lavender oil can be slightly risky, so be sure to consult a reliable professional first! As the University of Maryland and the Huffington Post report, lavender has been used with cats and dogs, as well as humans, as a calming agent or sedative. Again, though, be sure to seek advice from your vet about this use for lavender before purchasing new products, particularly if these products claim to be medicinal. Are Marigolds Toxic to Cats?